This is the first of two volumes focusing on chemical and biochemical sensors providing definitions, typical examples of chemical and biochemical sensors and historical remarks. It describes chemical sensor technologies and interdisciplinary tasks in the design of chemical sensors. The major part consists of a description of basic sensors. They include electrolyte sensors, solid electrolyte sensors, electronic conductivity and capacitance sensors, field effect sensors, calorimetric sensors, optochemical sensors, and mass sensitive sensors. This volume is an indispensable reference work for both specialists and newcomers, researchers and developers. 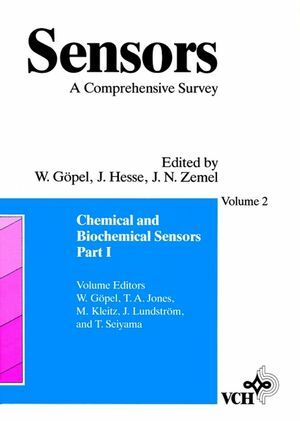 Wolfgang Göpel is the author of Sensors: A Comprehensive Survey, Volume 2, Part I, Chemical and Biochemical Sensors, published by Wiley. T. A. Jones is the author of Sensors: A Comprehensive Survey, Volume 2, Part I, Chemical and Biochemical Sensors, published by Wiley. Definitions and Typical Examples (W. Göpel & K.-D. Schierbaum). Historical Remarks (W. Göpel, et al.). Chemical Sensor Technologies: Empirical Art and Systematic Research (W. Göpel). Specific Molecular Interactions and Detection Principles (W. Göpel & K.-D. Schierbaum). Specific Features of Electrochemical Sensors (H.-D. Wiemhöfer & K. Cammann). Multicomponent Analysis in Chemical Sensing (S. Vaihinger & W. Göpel). Liquid Electrolyte Sensors: Potentiometry, Amperometry, and Conductometry (F. Oehme). Solid State Electrochemical Sensors (M. Kleitz, et al.). Electronic Conductance and Capacitance-Sensors (W. Göpel & K.-D. Schierbaum). Field Effect Chemical Sensors (I. Lundström, et al.). Calorimetric Chemical Sensors (T. Jones & P. Walsh). Optochemical Sensors (O. Wolfbeis, et al.). Mass-Sensitive Devices (M. Nieuwenhuizen & A. Venema).